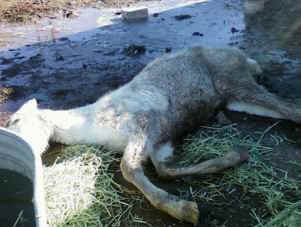 Animal control officers found a young filly in southern Utah, emaciated and frozen to the ground, barely alive. They rescued her and took her to a nearby sanctuary. Her caregivers there named her Elsa. Given round the clock care, the ordeal of being starved and exposed to the freezing harsh elements was too much for her and she died. A man was arrested and charged. The crime is considered a Class B misdemeanor. The punishment therefore is minimal. The law clearly needs to be changed so it is a real deterrent to these sorts of crimes. Animal control officers rescued the emaciated filly and her mother from the backyard of a home in Enoch City on Jan. 2 and took them to the nearby horse sanctuary - “This is absolutely one of the worst cases in my career,” said animal control officer Chris Johnson. No matter where you reside, please contact the Office of the Utah State Attorney General’s Office and the Governor of Utah. Ask the Attorney General to work with State legislators to strengthen equine protection laws so that the punishment fits the crime and acts as a deterrent. Ask the Attorney General to establish an animal cruelty database. This is very important information for law enforcement and not just for animals. People who commit acts of violence and murder often have a history of animal abuse. Repeat to the Governor of Utah. Some people complained about being asked to write letters. One commenting on the post stated we should have instead provided emails addresses to write to. We always have very good reasons for asking what we do. . . .I work in an industry in which letters to Legislators play a big part and I can attest to the fact that most Legislators like actual letters. Stacks of paper letters represent a call to action. Emails are often dismissed. This is 100% on point. We encourage you to take the time to send a letter, whether you are a resident of Utah or not. It is very important to horses like Elsa who suffer and die through abuse and neglect that we take action on their behalf, the right action.